r pi'* vU W 7 f el "
U. S. DEPARTMENT OF HEALTH, EDUCATION, AND WELFA "
more outbreaks in 25 States and the District of Columbia. outbreaks in Arizona reported in last week's MMWR (Vol. South Carolina........... 53 54 114 108 through previous months. Alaska Department of Health and Welfare). in two cases thus far. 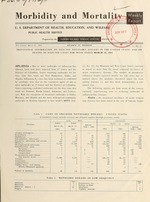 MI.D., Arkansas State Health Department). order to determine attack rates for influenza-like disease. been closed at the height of the epidemic. cine, Idaho Department of Health). Disease, New Hampshire State Health Department). ported outbreaks of influenza-like illness since January 1.
reported since the week ending January 5, 1963, is 2,640. South Central, West North Central and Mountain States. mortality has thus far been observed in the Pacific States. trated in the weeks ending March 2nd and 9th. M ,-rlnF,' cal ri i ... -. 196 1 . * i ,: 1 r,. I . NOTE: All deaths by place o occurrence. infuenza-like illness during the week e-_ March 9.
served in the State during the past week.